As the fight to save the Supreme Court continues, hundreds of protesters, activists, and progressive leaders came together on Monday in Washington, DC, to demand an end to Brett Kavanaugh’s Supreme Court nomination, especially in light of multiple allegations of sexual misconduct against him. Standing in solidarity with Dr. Christine Blasey Ford and Deborah Ramirez, two women who have accused Supreme Court nominee Brett Kavanaugh of sexual assault, hundreds of protesters filled the halls of the Hart Senate Office Building chanting “We believe Christine. 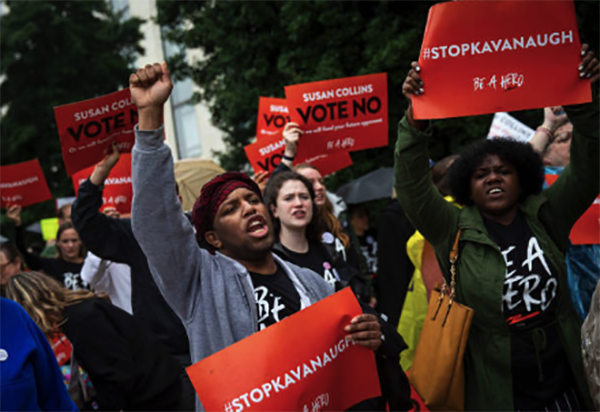 We still believe Anita Hill.” Women and allies shared harrowing personal stories of sexual assault outside the offices of Senator Collins and Senator Flake’s offices as they demanded that Congress oppose Kavanaugh's nomination. The number of protestors in the Capitol more than tripled since last week, when over 300 people were in attendance. On Monday, 109 were arrested in various actions. These actions made headlines in the New York Times, Vox, The Nation, HuffPost, The Washington Post, CNN, and ThinkProgress among many others. CPD affiliates DELACA, Make the Road New York, One Pennsylvania, Hoosier Action, Alaska Grassroots Alliance, Rights & Democracy, and SPACES joined our friends at Maine People’s Alliance, Mainers for Accountable Leadership, Women’s March, Ultraviolet, VOTEPROCHOICE, and more than 115 Yale Law Students in the actions beginning early in the morning on the steps of the Supreme Court. In their respective cities, CPD affiliates from around the country also joined a national walk-out called by #MeToo founder Tarana Burke, in support of Dr. Christine Blasey Ford, Deborah Ramirez, and the activists fighting the Supreme Court nomination on the ground in Washington, DC. Today, CPD is back in Washington, DC with network affiliates and allies to support Dr. Christine Blasey Ford in her testimony to the Senate Judiciary Committee. Our network is getting in formation to protect our democracy and amplify the voices of survivors of gender-based and sexual violence. Brett Kavanaugh is the least popular Supreme Court nominee in history. In the polls and on the streets, Senators have all the evidence that they need that Americans reject Kavanaugh. The CPD Network is in awe of the bravery survivors have shown in speaking their truths in the face of violent threats trying to suppress their voices. Survivors are united against Brett Kavanaugh because we need a Supreme Court justice who treats all people with dignity and respect. Brett Kavanaugh poses a grave threat to freedom, justice, and democracy. We will not let Senators act against our interests to confirm an accused sexual abuser who wants to dismantle health care, take away sacred indigenous lands, eviscerate immigrant protections, and further criminalize Black and Brown bodies. From Maine to Arizona, Alaska to Pennsylvania the CPD Network will continue to facilitate getting everyday heroes to confront power in Washington, DC. This is a defining moment. We must step up and demand our elected officials do everything they can to stop this nomination process. Please donate today to protect our values and support the resistance in the fight to #CancelKavanaugh.